Easy to fly Quadcopter… with HD camera! 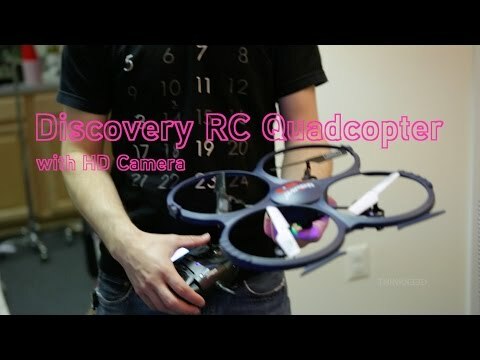 The Discovery RC Quadcopter with HD Camera is a ready to fly helicopter, right out of the box. Great option if you are getting into the world of remote control helicopters and don’t necessarily want to build the thing yourself. Aside from the fact that it has two different flight modes (maximum stability and expert control), it also has a bunch of other amazing features, such as: awesome HD camera which lets you take HD movies and pictures (1280 x 720p @ 30fps), an LCD display which gives you full flight mode status, 3 gyros and 3 accelerators for amazing motionless hovering… and the list goes on. Looking For Something Different Than This Remote Controlled Helicopter? Have a look at our Remote Controls section for more interesting ideas.